Web Message Manager doesn’t require installation - all its features are accessible online after logging in. The web-based application allows you to send text and multimedia messages to mobile phones all over the world from any PC connected to Internet. 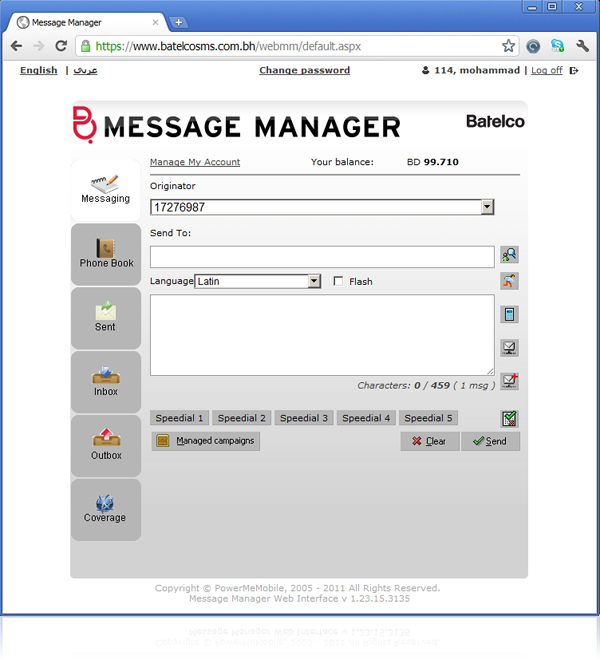 • Create advanced SMS / MMS messages with the help of templates, personalization and customization features, using various media files. • Save any of your created messages for future use and editing. • Receive messages to your Message Manager, and forward them if necessary. • Keep a flexible Phone Book provided with the nested groups of contacts, birthday reminders, advanced search and many other features, and share your contact database with your enterprise server. • Quickly define message recipient lists, using both the Phone Book or manual input. • Trace the outgoing messages history and monitor the delivery status of the messages sent from the PC or from the dedicated mobile phones. • Always work in your familiar environment, because your message templates, the contacts in your Phone Book, and other settings are saved on the server.